In order to prove that good still exists in the world, she's relying solely on the goodness of others to provide her with food, water, and shelter. After almost six months into Ho’s odyssey, humanity has not yet let her down, not even once. “The response I have received has been so amazing that sometimes I can’t even believe it myself. I feel like I am living in a utopia. I am the luckiest and happiest person in the world,” Ho recently told Humanity, while gearing up to start a new day of blading in Nebraska. Ho said her journey, to date, is validating her belief that regardless of backgrounds, everyone is deeply connected with one another. “The world is encircled by natural masterpieces, vibrant cultures, and, most of all, incredible people,” she said. As she rolls from the east coast to the west coast, Ho is also fundraising for One Girl Can, a non-profit organization that empowers young girls living in Kenya and Uganda, to end poverty, and create gender equality through an education and mentorship program. Ho said she wants girls in Kenya and Uganda to understand, through her rollerblading expedition, one girl really can turn her vision into a reality, and there are enough kind and giving individuals in the world who will help along the way. To date, strictly through online donations, Ho has raised over $19,000 for her Bladress Scholarship, which, so far, will educate at least 38 girls in Africa for one year. Her goal, by the time her trip has ended, is to fund a year of education for 120 girls. Ho, born and raised in Hong Kong, received her own education at different schools in the United States, Canada, and Europe. As someone who has always enjoyed traveling to study and embrace new cultures, Ho has been all around the globe and now is proficient in five different languages. Ho said that, at the age of nine, the freedom visiting new places provides called to her. When she was 15-years-old, a trip to New Zealand helped Ho realize the world was so different outside Hong Kong. She began studying abroad at the age of 16, and even embarked on a solo backpacking adventure across Central America at the age of 20 just to better appreciate the beauty of the world and its people. “I have never done any research before I go to a new place. That way I can experience it fresh, for myself,” Ho said. At the age of 21, Ho was struck with the idea to trek around the United States on a mission to showcase the best in humanity while supporting educational opportunities for girls in Africa. Hearing it would not be safe or even possible to venture alone through the United States with no money only made Ho more determined than ever to make her journey happen. 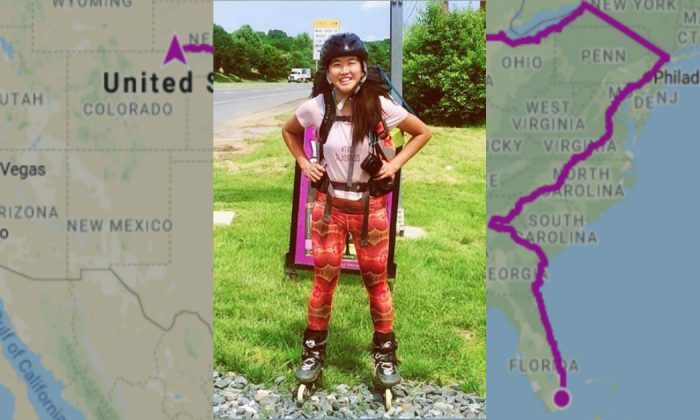 After researching her idea more, Ho decided that rollerblading from one state to the next would be the most efficient way to accomplish her mission, even though she had never even stood up on inline skates before. She purchased her first pair of rollerblades in 2016, allowing a then-stranger, now friend, to train her. She went from a beginner to experienced inline skater in about two months. When she first started, Ho experienced bruises and even needed 10 stitches in her scalp after one rough tumble, but she did not let injuries keep her down. In November 2016, Ho took a 19-day test run, going from Savannah, Georgia to Miami without cash in hand, depending on people to show her kindness when needed. Ho has had offers from others, including video crews, to go alongside her on the lengthy trip, but she declined. “I wanted to go solo all along and I was bent on helping fellow girls through female empowerment, as this is something close to my heart,” she said. Now, as she makes her way toward Oregon and inches closer to beating the world record for longest journey made on inline skates, which currently is 5,300 miles, Ho said she has not felt fear one single time. “If someone sees me rollerblading, and it is getting toward dark, they invite me inside for the night, even though they know nothing about me. Every day has been like this; random strangers offer to care for me,” she said. Ho said even little children have seen her resting at a park and invited her to go home with them for a meal or to sleep overnight. Each day, Ho begins rollerblading around 11:30 a.m. and usually travels about 20 to 30 miles before dusk. Ho said she receives the encouragement she needs each day to keep pressing on. “People stop me just to give me a hug or some water. One little boy even came up to me to give a special blessing,” she said. Even though she is offered money often, Ho refuses it. “It has been difficult, though, because sometimes I do find that money has been left in my backpack or inside my rollerblade. People just want to be sure I am safe and not hungry or thirsty. Humans are amazing,” she said. To track Ho’s travels or to donate to the scholarship, visit YaniseHo.com/the-bladress. She invites people to connect with her through Twitter, as well, @TheBladress. This article was originally published on Humanity.